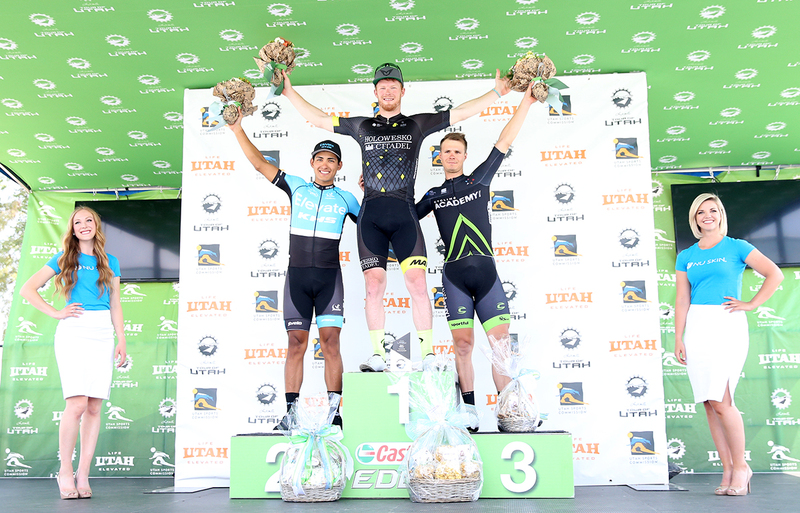 August 3, 2017 – South Jordan, Utah – American John Murphy of the Holowesko-Citadel Racing Team presented by Hincapie Sportswear surged past the field in a wild west sprint finish to win Stage 4 presented by Workfront at the Larry H. Miller Tour of Utah. Traversing 125 miles of high desert before a climatic finish in South Jordan City, Murphy crossed the line in four hours and 22 minutes. On Murphy’s wheel for second was Alfredo Rodriguez (MEX) of Elevate-KHS Pro Cycling. Mihkel Raïm (EST) of Israel Cycling Academy finished third. Raïm, who captured the first intermediate sprint in Cedar Fort, takes over the Utah Sports Commission Sprint jersey. Rob Britton (CAN) of Rally Cycling continued for a second day in the Larry H. Miller Group of Companies Overall Leader jersey, finishing safely in the bunch in South Jordan. The overall leaderboard remained unchanged for the General Classification — Britton retained a 26-second lead over Gavin Mannion (USA) of UnitedHealthcare Professional Cycling Team and a 28-second margin on Serghei Tvetcov (ROM) of Jelly Belly Pro Cycling p/b Maxxis. Riders in the 124-rider field battled each other and the scalding temperatures through the Rush Valley, passing the Oquirrh Mountains. Dynamic and chaotic racing marked the first hour and a half until the six-rider breakaway was finally established. The first move, initiated by American Tyler Williams of Israel Cycling Academy, came 11 miles into the stage. Relentless attacking continued, with the yellow jersey Britton participating at the front. Rally Cycling wanted to make sure that the right combination of riders and teams were allowed up the road, while sprinters teams were shutting down any move that included sprinters. The field was still together as they approached the first of two Utah Sports Commission Sprint lines in Cedar Fort. Led out by his Axeon Hagens Berman team, Chris Lawless (USA) opened his sprint first, but deviated from left to right of the road forcing Raïm in the gutter. After review, officials relegated Lawless, giving top points to Raïm. Lawless' teammate Rui Oliveira (POR) was second and Ty Magner (USA) of Holowesko l Citadel Racing Team third in that sprint. Attacks continued to fly until a group of five riders escaped 38 miles into the stage. The break included Lorenza Rota (ITA) of Bardiani CSF, Marco Zamparella (ITA) of Amore & Vita – Selle SMP presented by Fondriest, Gonzalo Serrano Rodriguez (ESP) of Caja Rural-Seguros RGA, Taylor Sheldon (USA) of Jelly Belly Cycling p/b Maxxis and Daniel Turek (CZE) of Israel Cycling Academy. Two miles later, solo chaser Brian McCulloch (USA) of Elevate-KHS Pro Cycling made the junction, making it six up the road while the field settled in behind them. Britton's team remained in control, letting the gap extend to a maximum of five minutes and 30 seconds before slowly reeling them in. Heat was definitely a factor with riders dumping water on their heads and putting iced-filled socks down their back to cool their body temperatures. With 90 miles to go, under orders from his Israel Cycling Academy team director, Turek stopped working in the break, causing an uproar with his break companions. Seven miles later, Rota took a flyer off the front, was soon joined by Gonzalo Serrano Rodriguez, and the duo dug deep in a desperate but doomed dash for victory. The field was all together as they entered the first first of two finishing circuits in South Jordan. Rota was awarded the Larry H. Miller Dealerships Most Aggressive Rider jersey for his efforts. Teams continued to battle for position on two laps of the 3.5-mile circuit in South Jordan. American Travis McCabe of UnitedHealthcare launched his sprint with 800 meters to go, but faded to take sixth on the stage. “I had two teammates who were leading me out. Personally, I think we started too far back to sprint. We were coming fast, but with 1K (kilometer) to go, we were 45th position I think. I had good legs for the sprint. Probably I was the fastest guy today, but I wasn't the best. These two guys (Murphy and Rodriguez) were better than me,” Raïm added. Eric Young (USA) of Rally Cycling, who sprinted to stage wins at this race in 2014 and 2015, was voted America First Credit Union Fan Favorite for Stage 4 presented by Workfront, in the category of Best Sprinter. Jacob Rathe (USA) of Jelly Belly Cycling presented by Maxxis retains the Utah Office of Tourism King of the Mountain jersey and Neilson Pawless (USA) of Axeon Hagens Berman Cycling Team will continue in the WCF Insurance Best Young Rider jersey. Stage 5 presented by Zions Bank returns to Davis County on Friday, Aug. 4 for a third consecutive year. New for 2017 will be an inaugural stage start in Layton. The 112-mile course will roll through Hill Air Force Base for the first time, passing the Hill Aerospace Museum, the largest museum west of the Mississippi River. 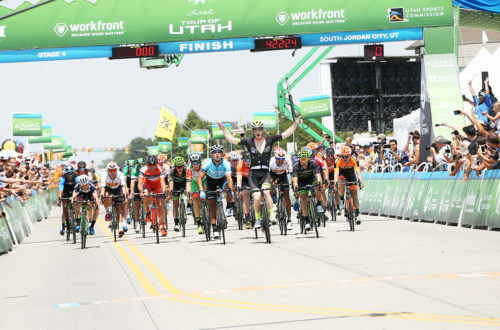 After two crushing climbs across the Bountiful Bench, each designated with a Utah Office of Tourism KOM, the 4,200-feet of climbing of the stage will end on Main Street in Bountiful.